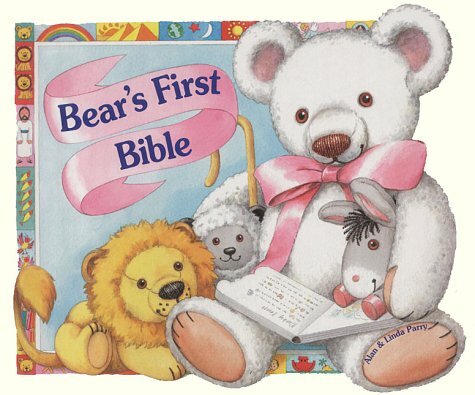 With teddy bear shaped die-cut pages and colourful nursery pictures of stuffed toys, this book tells a number of familiar stories from the Old and New Testaments. Each double page spread has a page of text facing a large illustration of Teddy, the storyteller, with his friends. The text is liberally interspersed with rebus (a picture representing a word) so there is lots of interaction for the child reading with an understanding adult. The stories tackled are The Creation, Noah's Ark, Joseph's New Coat, Daniel in the Lion's Den, The Annunciation and Nativity, Jesus Fishing with His Disciples, and finally, the Crucifixion and the Resurrection, here called 'The Sad and Happy Story'. The text is rather more propagandist than most religious publishing for children these days: 'Jesus brought such happy news. All those who believe in Him will go to heaven, too, and live with Him forever! "We believe in Jesus," said Teddy. "Do you?" ' Thorny questions for the under-fives!